After reaching the bunker, it took Lindsay half an hour to calm down. Her heart felt like it was beating right out of her chest. It hurt and her limbs burned from the draining adrenaline. Images of the Infected horde coming for them played over and over in her mind and each time a shiver of fear shot through her. They’d been saved by complete chance but next time, they wouldn’t be so lucky. She sat with her back to the wall, huddled over a warmed can of pasta, her knees drawn up tight to her chest. Staring into the mix of noodles and sauce, she found she wasn’t hungry. It was only when Katie walked into the bedroom that she looked up. Her friend looked perfectly fine, not worried or shaken at all. How was that possible? How was she so strong? Lindsay felt like she might burst into tears at any moment. They’d almost died. Katie had almost been killed because of her hesitation and incompetence. Lindsay lowered her eyes quickly, feeling ashamed. “You all right?” Katie said, her voice soft and kind. That made Lindsay feel even worse. Her friend should be blaming her, yelling at her! She felt a hand on her arm, still chill from the outside. Katie knelt in front of her and their eyes met. Lindsay wanted to look away but couldn’t. Instead, the tears came and so did the uncontrollable shivering of fear. Wordlessly, Katie drew her into her arms and held her. Lindsay cried long and hard, unable to stop. Every time she tried, the thought of giving herself to the horde— so that Katie might live—came again. It was all she was good for and it made her cry even harder. She didn’t deserve to be here. Katie needed someone better. That’s not what I meant! she wanted to scream but the words didn’t come. No matter how hard she willed them, they simply stuck in her throat. She found herself exhausted, mentally and physically. Every muscle burned and her lungs felt heavy with lack of breath. “You’re safe now, okay?” Katie said and smiled at her in that almost shy way she did everything, as if she wasn’t sure it was the right thing to do. Lindsay never understood how someone so competent could ever think they’d done the wrong thing. Except that once. Except Erin. Lindsay hadn’t brought her up since that night. It had been the first time she’d seen Katie truly vulnerable, unable to do anything. Aborting the child had broken her. Lindsay said the same words to her that night on the phone. You’re safe now, okay? They’d felt so right at the time, even if Katie was hundreds of miles away at a hospital clinic and Lindsay was laying in bed in Mount Hope. Those words had helped. Somehow. “Thank you,” Lindsay said, realizing that they were helping her too. She sniffed again, then sighed and laid her head back against the wall, closing her eyes. She was just so tired. They said very little for the next few hours, eventually crawling into their beds in silence. Lindsay didn’t even bother to change out of her clothes. The moment she closed her eyes, she slept. Her dreams were full of nightmares. Brief flashes of infected reaching out for her, of running, biting, fighting, screaming. It ended with a muzzle flash and the sound of her mother’s voice, asking if she was going to be late for dinner. She woke thinking that all of it had been bad dream, that her mother was right there, asking her to come down to the table. Her dad and brother would be there too, even though Lindsay hadn’t seen them in a while. In her sleep-addled state, it made sense. Katie shook her arm, breaking the spell. One look at her friends dirty, haggard face brought it all back. The memories threatened to crush her but she swallowed it down. Katie’s tone worried her. As she slipped out of the bunk and into her shoes, her heart began to race. Were zombies trying to get in? Had they found a way through already? That spike of fear was back, heightening her senses. With it came the realization that all was quiet, except for a mechanical beeping. That’s the radio, Lindsay thought. She’d tried to use it half a hundred times to contact that National Guard guy, Zach Evans she thought she remembered, in Geneva. She wanted to reach her mom but nothing ever went through. For three months it had been silent. The voice was male and husky, modulated slightly by static and the empty tone of the wireless speaker. It was like talking to someone on a cellphone with really poor reception. Together, they entered the room with the radio and Katie sat at the desk, picking up the receiver. At first Katie just held it, not pushing down the call button. They looked at one another, but Lindsay didn’t know what to say. She didn’t know the voice. Lindsay watched as Katie’s fingers squeezed the button in. There was a soft click, indicating that their line was now open and transmitting. Lindsay held her breath. “Who is this?” Katie said. Silence answered her. She called again, repeating the message. A hiss of static came back over the line, loud and high pitched. Katie reached out to a dial and twisted it. The noise died down a little. “Hello? Hello!” Katie said, squeezing the transmit button over and over again. It didn’t matter. No matter how many times she tried, Cafferty gave no response. Lindsay looked at her friend, her heart was beating hard again, but this time not from fright. The Army! The Army was in Thorpe! That wasn’t very far. It was a ten minute drive from home! Katie didn’t look so sure. Her eyes were squinted, staring at the transmitter. She licked her lips and placed the handset back in its pedestal. “Where have they been for three months?” Katie said, standing up and pushing past her. Lindsay followed after, crossing into the bedroom where Katie was checking her rifle over again. That made Lindsay wary again. That brought her up short. Bombed? Her home was bombed? Lindsay was stunned. How could they just bomb the town? What about her house? Her mom? And then they can save you, Lindsay thought, reaching out to squeeze Katie’s hand. It would be a relief. Others could do it, others could protect them. Protect her. She’d be safe. Maybe they both would. “I just don’t know,” Katie said, looking back towards the storage area. “It’s time to go,” Lindsay whispered, squeezing her hand again. This time, Katie squeezed back. 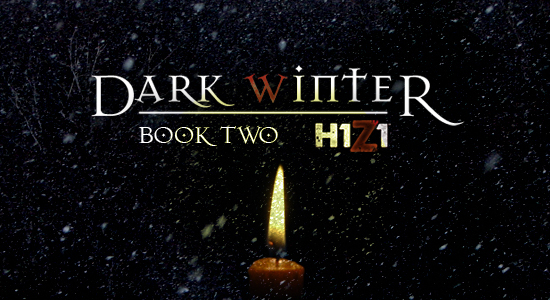 This entry was posted in Dark Winter, Fan Fiction and tagged Dark Winter, H1Z1, SOE, Zombie Apocalypse. Bookmark the permalink. I love bow Lindsey has no clue to the power she holds over Katie. Being so innocent, genuine, and kind she acts as a moral compass and grounding rod. Katie seems to look to that as how she wishes she could be… That makes Lindsey pretty powerful cause she could have katie do anything! I’m with Katie sensing distrust until I know more about what’s going on…..this was very emotional…….I love that I have to read the next chapter.